SAP solutions are central to IT-environments for organisations around the world, managing all types of data, from sales and customer relationships to finance and business operations. The importance of these systems requires a comprehensive business continuity management strategy, focusing on Recovery Point Objectives (RPOs) and Recovery Time Objectives (RTOs). SEP’s certified hybrid backup and bare metal recovery solution provides reliable and scalable data protection for all SAP environments. SEP can quickly recover an entire SAP environment in the event of a disaster. SEP Hybrid Backup Solution is installed in over 50 countries worldwide and is used by the world’s leading governments, institutions and universities in the most varied environments, ranging in both size and complexity. SEP protects heterogeneous, virtual and physical environments of any size and supports the systems no competitor can. SEP has been partners with SAP since 2002 and offers certified backup and recovery software for the complete SAP solution stack including SAP HANA, SAP Business One, SAP NetWeaver on various databases and SAP ASE. SEP offers solutions for service providers, who are running Backup-as-a-Service (BaaS), on-premise and in the cloud, based on the SEP technology. SEP provides a comprehensive, reliable and cost-effective data protection and recovery solution for business-critical information from small to large enterprises, covering both, market leading and niche hypervisors, applications, databases and operating systems, as well as SAP products. 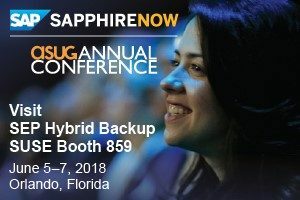 Visit SEP at the SUSE booth at the 2018 SAP SAPPHIRE NOW & ASUG Annual Conference to see a live demo and find out more about SEP’s Hybrid Backup solution. For more information visit: www.sepsoftware.com.